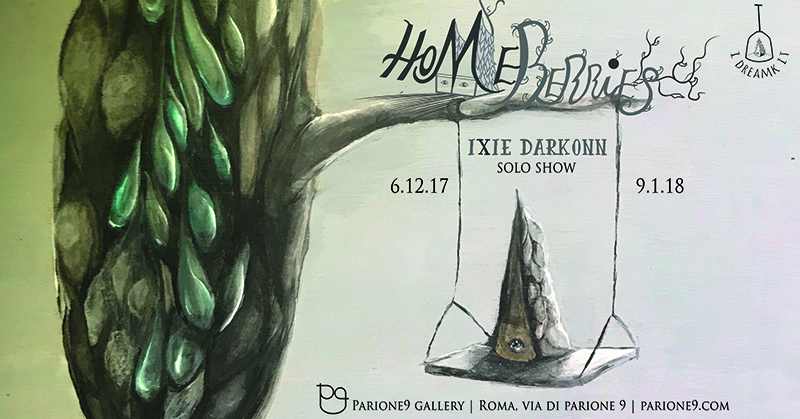 Il 6 dicembre 2017 Parione9 Gallery inaugura “Homeberries” mostra personale di Ixie Darkonn all’interno della prima edizione di “I Dreamk it: lo bevo + lo sogno”. Parione9 Gallery presenta la prima edizione di I Dreamk it, un progetto di Ixie Darkonn: Nutrirsi. Dissetarsi. I bisogni primari della vita. Uno spuntino allo spirito, per lo Spirito. In occasione di questa prima edizione Ixie torna in Italia con Homeberries, mostra personale in programma dal 6 dicembre 2017 al 9 gennaio 2018 presso la Parione9 Gallery. I Dreamk it è un format, una rassegna che vede l’arte sulla bottiglia e il vino in galleria. Ogni anno artisti di fama internazionale, invitati dalla Darkonn, saranno protagonisti delle successive edizioni insieme alle etichette dei migliori vini italiani, selezionati da Livia Belardelli, partendo da qui per girare il mondo. Ixie Darkonn Artist, curator & film director. Negli ultimi anni si è dedicata alla scrittura di romanzi e sceneggiature e ha curato mostre internazionali negli USA (Painted Sound, dove artisti sono stati chiamati a dipingere la musica per renderla visibile a chi non può sentirla) con le quali la Darkonn ha coinvolto artisti più importanti del panorama surrealista internazionale e per le quali ha realizzato cortometraggi. Ixie Darkonn torna in Italia dopo il suo ultimo grande progetto su Tim Burton (Nightmare In Wonderland Project) presentato a Chicago, Vancouver, San Diego e Berlino. Ha esordito in collettive alla fondazione Juan Mirò di Barcelona, a San Francisco, a Detroit e a Los Angeles in gallerie come La Luz De Jesus Gallery e la Distinction Gallery. Una sua opera pittorica fu scelta dalla Universal Pictures per rappresentare il film Snowhite And The Huntsman e fu esposta ad Hollywood accanto agli abiti originali del film della costumista premio oscar Colleen Atwood. Nello stesso anno (2012) la Dorothy Circus Gallery di Roma presenta una sua personale nel White Velvet Space. Parione9 Gallery presents the first edition of I Dreamk it, a project by Ixie Darkonn. To eat. To drink. The basic human needs. A refreshment for the Spirit. On the occasion of this first edition Ixie makes her return to Italy with Homeberries, her solo show, planned from the 6th November 2017 until the 9th January 2018 at the Parione9 Gallery in Rome. I Dreamk it is a format, a review, that sees the art on the bottle and the wine in the gallery. Every year artists from all around the world, invited by Ixie, will be involved for the next editions alongside the best labels of Italian wine, chosen by Livia Belardelli. This is the poetry of Ixie Darkonn, descendant of a family rooted in centuries of nobility and artists. Ixie, whose multifaceted activities can be hardly summarised in one term, when asked “Are you a painter? A director? A stylist? A writer? An artist?”, she replied defining herself like an “Art Hunter”, someone who finds art in living. Ixie Darkonn Artist, curator and film directorIn the last few years she’s dedicated herself to writing novels and scripts and she curated international exhibitions in the USA (Panted Sound, where artists have been called to paint music for those who can’t hear it) in which Ixie has involved many international surrealist artists and created some short films.Ixie Darkonn makes her return to Italy after her last project on Tim Burton (Nightmare In Wonderland Project), shown in Chicago, Vancouver, San Diego and Berlin.She began at the Juan Miró Foundation in Barcelona; in San Francisco, Detroit and Los Angeles at galleries like La Luz De Jesus Gallery and Distinction Gallery.One of her artworks has been chosen by Universal Pictures to represent the film Snowhite And the Huntsman and it has been displayed in Hollywood next to the original clothes of the film of the costume designer Award winning Colleen Atwood. In the same year (2012) the Dorothy Circus Gallery in Rome presented a personal exhibition made by her in the White Velvet Space.